October 10, 2017 (Boca Raton, Florida): The Mathew Forbes Romer Foundation, in partnership with Nova Southeastern University and JScreen, will be hosting a Genetic Screening event his Wednesday, October 25th from 10am to 2pm at the Rick Case Arena at Nova Southeastern University. This is the first of three genetic screening events over the next few months, with two events following in Palm Beach County and Gainesville. Where: Rick Case Arena at the Don Taft University Center (1st floor Arena/Main court); Nova Southeastern University. Details: Pre-register at JScreen.org and request a kit. Select NSU 2017 from the dropdown. Enter insurance info on step 2. Enter coupon code NSU207 on step 4 and click apply. Finally, pick up your screening kit at the event location. Screening is free for the first 50 people to pre-register with insurance. After that, screening is subsidized to $149 with insurance. Usually, costs $1100 for the test! Screening can be done with saliva test rather than blood! Last year, at the Genetic Screening, there was a 50% detection rate of fatal genetic disease carriers. According to Kevin Romer, president of the Mathew Forbes Romer Foundation, when the they first offered the testing they only tested for 4 diseases and had a 20-25% detection rate. This year, the screening panel will test for over 200 diseases (including those most commonly found in the Jewish population) and are doubling the detection rate. JScreen is a not-for-profit at-home education and carrier screening program for Jewish genetic diseases. The goal of the program is to give individuals and families easy access to information and to allow testing to be done conveniently from home. Testing is performed by a certified laboratory and results are reviewed and reported to participants by genetic counselors. In some states, test results must be reviewed and reported by a specific healthcare provider, and if so, JScreen genetic counselors will work with the provider to ensure you receive your results and any needed follow-up in a timely manner. 80% of babies with genetic diseases are born to parents with no known family history of that disease. Early genetic screening is an important step in planning for a healthy family, and allows you to take control and make choices about your future. Being a carrier of a genetic disease means that even though you or your partner do not show symptoms, you can still pass that disease to your child. 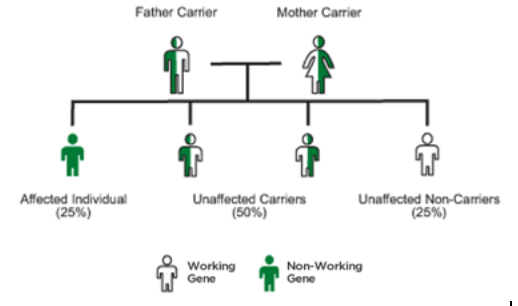 If you and your partner are both carriers of the same disease gene, each of your children has a 25% chance of being born with the disease itself. More information: https://jscreen.org/reasons-for-genetic-testing/ or www.MFRFoundation.org.